The Magnetite, Adjustable Pitch Axial Fan utilises high performance Elta impellers and next generation, permanent magnet motor technology to increase energy efficiency, lower noise output and reduce overall unit weight. The Magnetite features infinitely variable speed control and is available in 13 sizes, extending from 315 to 2000mm diameter. 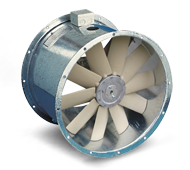 Optional guide vanes can further improve fan efficiency and increase pressure development which can lead to high air flow performance. Commercial and industrial, supply or exhaust applications such as hospitals, schools and universities, convention centres and office blocks.